The section will help you with steps to install JL Kerna template – Quickstart and Manual installation. Which installation method you should use depends on the current status of your site. Also, before installing either the template manually or the Quickstart Package, please make sure you meet the Joomla! and the template requirements. JL Kerna template is built on Gantry 5 Framework so it requires Gantry 5 Framework to be installed and enabled in your system. Also, please have a look at the Gantry5 requirements. Basically, they are the same as the above, but you will find some additional details there. The quickstart allows you to replicate JL Kerna demo to your server. It means, after install the quickstart, you will have a site exactly the same as the demo site. Download JL Kerna quickstart package →, upload to your server and extract it. Manual Installation refers to installing the template on your Joomla! powered website. This means you already have a website with content items, modules, extensions, so you just decided you want to improve the design of your website. You can find step-by-step instructions as well as a video instructions regarding the Manual Installation in the Gantry5 Documentation, in the “Installation” chapter. Go to: “Extensions → Template Manager”, set JL Kerna template style as your default template style. This is just a simple one click task. If there is a newer version of the Gantry Framework released you will notice that in your Joomla Admin as well as in the Template Manager. Then just click on the button. You might also want to read the “Updating” and “Updating Themes” chapters in the Gantry5 Documentation. Please have a look at the Gantry Documentation in order to discover what Gantry is all about, the core-concepts behind it, and how to get started with this next-generation framework. You do need to read the Gantry Documentation in order to be able to setup and configure our templates on your website. The Layout Manager is used mostly for creating your module positions. Apart from the module positions, you should also keep the static content in the Layout Manager. By “static content” we mean the “Logo” particle, the “Menu” particle, the “System Messages” particle, the “Page Content” particle, the “To Top” particle and the “Mobile Menu” particle. If you want to hide some modules/elements on some devices (phones, tablets, etc) you should use the hidden-phone, hidden-tablet, etc. classes but you should add them in the particular module positions (under the “Block” tab) in the Layout Manager, rather then in the “Module Class Suffix” field for the particular module. You will find more details in the “Layout Manager” chapter in the Gantry Documentation. As mentioned above, you create your module positions in the Layout Manager, but then you will use the Module Manager to assign your modules, as you would do in any other framework as well as in the default Joomla! 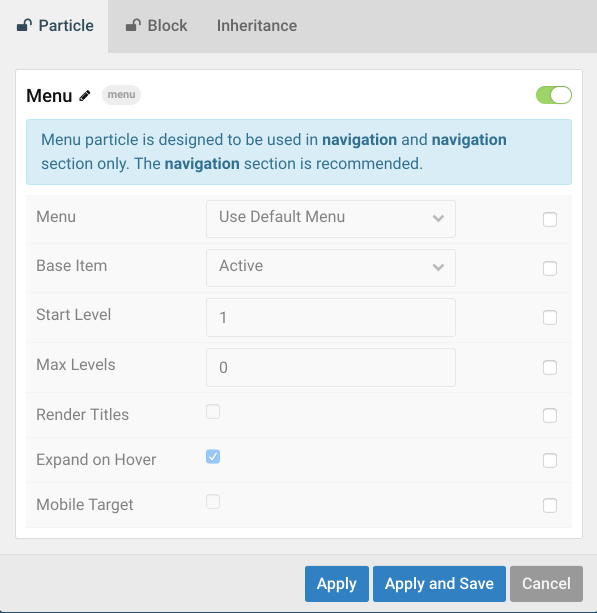 In order to publish the custom particles that come with the template you will use the “Gantry5 Particle” module in the Module Manager, rather than adding them directly in the Layout Manager. If you want to change the style of some sections (background color, background image, text color, etc.) globally, for the whole website, you should do it under the “Styles” tab in the “Base” outline. The “Base” outline holds the defaults for the whole website. You can then override those defaults in each outline you create. If you want to load an asset (JS, CSS, etc.) globally in the whole website, you can do it under the “Page Settings” tab in the “Base” outline. If you want to create an empty page so you can assign modules to it, you will use the “Gantry5 Themes” -> “Custom Page” menu item type. Previously, you would use the “Featured Items” menu item type. Please have a look at the Atoms sections in the Gantry Documentation so you know what they are all about. Atoms basically load assets (scripts and stylesheets). Gantry5 comes with a brand new Particle system which makes it easy to create, configure, and manage content blocks. Basically, everything that you would create a Custom HTML module for is now coded in to a particle. You no longer need to copy/paste long HTML codes and edit them, you just need to click here and there and fill out fields in the Admin. In this chapter we will show you the custom particles that we developed as well as some of the core Gantry 5 particles that we modified and enhanced, for example the “Social” particle. For more information about the core Gantry5 particles, please have a look at the “Particles” chapter in the Gantry5 Documentation. This section will help you understand about the Demo pages for Kerna. How to design, reuse the content from quickstart package. Instead of starting from scratch, use our pre-designed pages to jumpstart your design process or get inspired. This is where you can edit the Offcanvas section. Anything here should appear on offcanvas on mobile devices. The default mobile menu always here so don’t remove it, just add what you need to offcanvas here. This outline is assigned to Main Menu -> Home. If you want to edit the assignments and move it to another menu, please select Default from the outline list then switch to Assignments tab. You can assign this outline to whatever menu you want, then click the save assignments button. The Top Bar section inherited from base outline so it copies particles and settings from base outline. If you want to edit this section for all pages, please go to base outline -> section 1 above to edit the Top Bar. If you want to edit for only home page, remove the inheritance then edit it like base outline -> section 1 above. The navigation section inherited from base outline so it copies particles and settings from base outline. If you want to edit this section for all pages, please go to base outline -> section 2 above to edit the navigation. If you want to edit for only home page, remove the inheritance then edit it like base outline -> section 2 above. The Slideshow Section contains module position – Slideshow. To select which module appears in this place. Go to Extensions -> Modules, select your modules you wish to display, then switch position to the name of module positions, then save it. The Intro Section contains 2 rows, row 1 Heading Particles, row 2 Intro text (Custom HTML Particles) and Progress Bar 2 Particles. The Features Section contains Joomlacontent Particles. The Calltoaction Section contains Calltoaction Particles. To edit the Calltoaction, click the Calltoaction particle icon settings. The Testimonial Section contains 2 rows, row 1 Heading Particles, row 2 Testimonial Particles . The Expanded Section contains Portfolio Particles . The Utility Section contains 3 rows, row 1 Heading Particles, row 2 Featurebox Particles, row 3 Readmore Button (Custom HTML Particles). The Utility Section contains Member Particles. The Above Section contains 2 rows, row 1 Heading Particles, row 2 Module Position Contact Form. The Bottom Section contains 2 rows, row 1 Heading Particles, row 2 Pricingtable Particles. The Clients Section contains Wanted a free.. (Custom HTML Particles) and Module Position – Subcribe. The Above Footer section inherited from base outline so it copies particles and settings from base outline. If you want to edit this section for all pages, please go to base outline -> section 3. If you want to edit for only home page, remove the inheritance then edit it like base outline -> section 3 above. The Footer section inherited from base outline so it copies particles and settings from base outline. If you want to edit this section for all pages, please go to base outline -> section 4. If you want to edit for only home page, remove the inheritance then edit it like base outline -> section 4 above. The Offcanvas section inherited from base outline so it copies particles and settings from base outline. If you want to edit this section for all pages, please go to base outline -> section 5. If you want to edit for only home page, remove the inheritance then edit it like base outline -> section 5 above. This outline is assigned to Main Menu -> About . If you want to edit the assignments and move it to another menu, please select About from the outline list then switch to Assignments tab. You can assign this outline to whatever menu you want, then click the save assignments button. The Pagetitle Section contains 2 rows, row 1 Heading Particles, row 2 Module Position Breadcrumb. The Intro section inherited from Default so it copies particles and settings from Default. If you want to edit this section for all pages, please go to Default -> section 4. 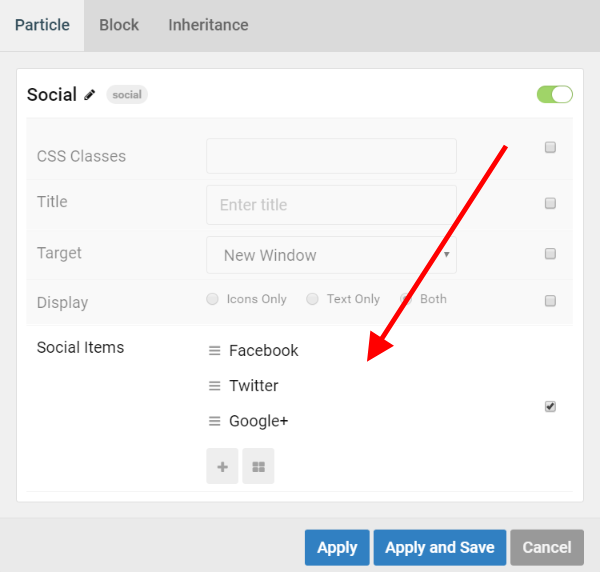 If you want to edit for only About Page, remove the inheritance then edit it like Default -> section 4 above. The Member Particles (Inheriting from Defalut), If you want to edit this Particles for all pages, please go to Default -> 10.1. If you want to edit for only About Page, remove the inheritance then edit it like Default -> section 10.1 above. The Parallax Section contains 3 rows, row 1 Why You Must Choose Us? (Custom HTML Particles), row 2 Featurebox Particles, row 3 Services Button (Custom HTML Particles). To edit the Articles page, switch to layout tab. This outline inherited all from the base outline so if you want to edit, please edit the base outline or remove the inheritance and edit it like the base outline. The most important thing in this outline is the container Section which is devided into 3 column, each column is a sub section. The Mainbar sub section contains system messages particle and page content particle. The first row with system messages display important joomla message like login failure. The last row with page content display joomla article content. The Sidebar and Aside is the left and the right side of mainbar. You can add any particle or module position here to display things like tags, category, search … beside joomla article content. This outline is assigned to Main Menu -> Pages -> Comingsoon . If you want to edit the assignments and move it to another menu, please select Comingsoon from the outline list then switch to Assignments tab. You can assign this outline to whatever menu you want, then click the save assignments button. The Testimonial Section contains 3 rows, row 1 Heading Particles, row 2 Countdown Particles, row 3 Module Position Subcribe. This outline is assigned to Main Menu -> Contact . If you want to edit the assignments and move it to another menu, please select Contact from the outline list then switch to Assignments tab. You can assign this outline to whatever menu you want, then click the save assignments button. The Maps Section contains Module Position Google Maps. The Bottom Section contains Module Position Contact Form and Contact Info (Custom HTML Particles). This outline is assigned to Main Menu -> Pages -> FAQ . If you want to edit the assignments and move it to another menu, please select FAQ from the outline list then switch to Assignments tab. You can assign this outline to whatever menu you want, then click the save assignments button. The Testimonials Section contains 2 rows, row 1 Heading Particles, row 2 Accordion Particles. This outline is assigned to Main Menu -> Pages -> Services . If you want to edit the assignments and move it to another menu, please select Services from the outline list then switch to Assignments tab. You can assign this outline to whatever menu you want, then click the save assignments button. The Features Section contains Featurebox Particles. This outline is assigned to Main Menu -> Pages -> Team . If you want to edit the assignments and move it to another menu, please select Team from the outline list then switch to Assignments tab. You can assign this outline to whatever menu you want, then click the save assignments button. The Testimonials Section Member Particles. This outline is assigned to Main Menu -> Pages -> Timetable . If you want to edit the assignments and move it to another menu, please select Timetable from the outline list then switch to Assignments tab. You can assign this outline to whatever menu you want, then click the save assignments button. The Testimonial Section contains 2 rows, row 1 Heading Particles, row Time Table Particles. JL Kerna comes with unlimited module positions. Thanks to the awesome Gantry 5 framework you can now easily create as many module positions as you want. You just need to go to the Layout Manager, drag and drop the “Module Position” particle wherever you want it to be and set the module position name. Learn how to create any positions quickly without coding here. The best thing you can do (and actually you MUST do) is to install the Quickstart Package and see how everything is configured and what module class suffixes are used for each module. All your customization (custom code) should be placed in your “Custom Style Sheet” file. This is the custom.scss file. By default, the custom.scss file does not exists, so you will need to create it. You need to create this file in root/templates/TEMPLATE_NAME/custom/scss. You will find all details in the Gantry5 Documentation, in the “Adding a Custom Style Sheet” chapter. The Web is full of all kinds of different Joomla extensions. Throughout the years we had the chance to work with many extensions from many different providers which helped us to filter the best of best ones. The extensions that we use in our templates have the cleanest code, the best functionality and they’ve been very well supported by their developers. Below you will find the Download link and the Documentation for each extension (Component, Module, Plugin) that we have used in this template. If you have any specific request or feedback as well as suggestions, feel free to drop us a line in Ticket System. We’ll try to cover them all.